Learn how your business’s international online credit card transactions are processed by viewing our credit card diagram and subsequent information below. For more information about our credit card diagram and credit card processing services, please call 441-296-5598 or 441-294-4622. Merchant submits data from the sale to FAC’s international payment gateway over a secure connection. 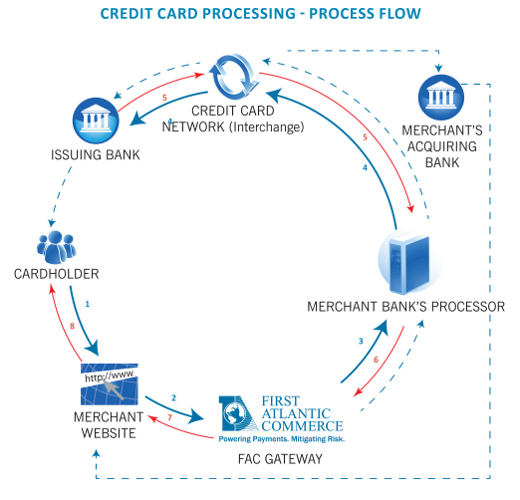 FAC formats the data and passes it to the merchant bank’s processor via a secure connection. The merchant banks processor submits details to the credit card network (Visa & MasterCard interchange), which routes the transaction to the bank that issued the customer’s credit card (Issuing bank). Issuing bank approves or declines the transaction and passes the transaction results back to credit card Interchange. Interchange then sends transaction results to the merchant banks processor and processor relays results to FAC. FAC updates its systems with results and sends them to the merchant showing approval or decline of the transaction. The merchant provides a real-time response to the customer. The issuing bank then sends the funds to the credit card network, which passes those funds to the merchant’s bank (acquiring bank). The bank deposits or settles the funds into the merchant’s bank account.